ORGŌNE w/ The Kris Lager Band! Now and always, Orgōne delivers dirty, organic, California soul with heart; music that grabs you by the collar, pulls you to your feet and shoves you wantingly onto the dance floor. It all started with two kids from the San Fernando Valley, whose shared affinity for gritty soul records of the 60s and 70s collided with the colorful music cultures brewing in Los Angeles during the late 90s. That friendship sparked a movement, and Orgōne has been delivering nothing but gold to the funk faithful ever since. 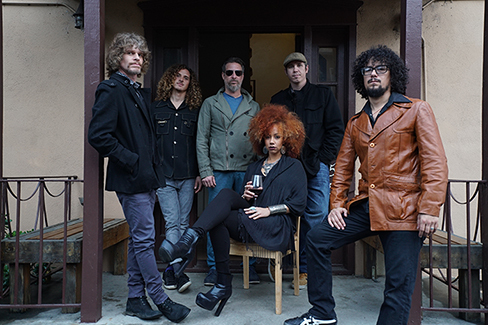 Fearless vocalist Adryon de León elevates the octets soulfulness to intoxicating new levels on Orgone’s latest studio album, Beyond The Sun. Dubbed “stank face inducing glory” by Okayplayer, the record is a lightning rod of inspiration for a new generation of funk music lovers. Following the 45 release in April of “I Sold My Heart to the Junkman” featuring Cyril Neville, Orgone plans to drip steamy new singles one by one into the world throughout 2017.